You probably know I’ve been learning about trading stocks, cryptocurrency and bonds. I’ve been learning nonstop – 17 hours a day, looking at charts. I’m working on being able to see the same patterns over and over again. Life is patterns, no matter what your profession or what you do in life. I’ve been virtual trading for some time, and now I’ve decided it’s time to rip the bandaid off and start paper trading – using the patterns to figure out how to become successful at this. I know a lot of you who’ve listened to me are trying to meet someone, trying to work on techniques of meeting someone, work on how to become social – almost like paper trading through life, all you possibly can. Think about that – you’re literally life trading nonstop. Trying to figure out exactly how you, as a person, can start to see the patterns in people and start taking to them. So today was my day to rip the Band-Aid off… tune in and I’ll tell you what happened. 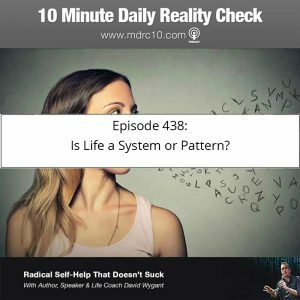 Episode 438: Is Life a System or Pattern?